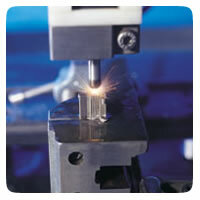 Small Hole EDM utilizes the EDM process and copper rod to bore through hardened materials that otherwise could not be conventionally machined. It complements our wire EDM machines by creating starter holes and is also commonly used for creating coolant, vent, and ejector holes. Hole diameters from .012" to .120"